Is it possible to tell if a BJT circuit is PNP or NPN simply by looking at the circuit? For example, for the circuits shown, how can we tell if they're PNP or NPN? This question does not appear to be about electronics design within the scope defined in the help center. Quite simply, look at the arrow on the leg. The arrow will always be on the emitter. Look at where the current flows. The arrow will always follow the current flow. When the arrow is pointing away from the base, it is an NPN. When pointing towards the base, it is a PNP. 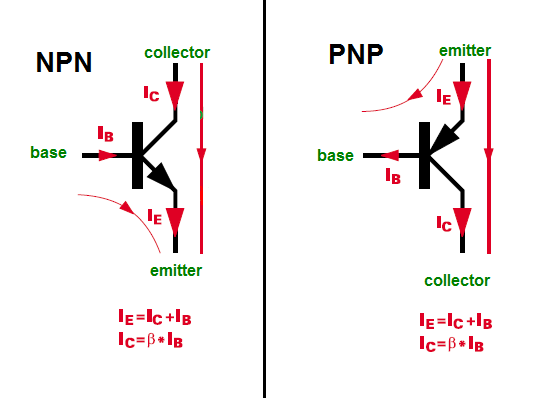 If the arrow points towards the base it is a PNP, if it points away from the base it is an NPN. Further, the arrow will typically be on the more positive leg for PNP and negative for NPN. Not the answer you're looking for? Browse other questions tagged bjt or ask your own question. Bipolar Junction Transistor problem. Where did I go wrong? 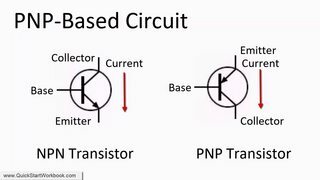 What's the difference between NPN and PNP transistors? Why are the current directions in the hybrid-\$\pi\$ model for BJT the same for both NPN and PNP? What's the differences of these usage of PNP, NPN transistors? How do I implement a DPDT-switch here using NPN/PNP instead?